No need to settle for Arrowhead or Sparkletts. 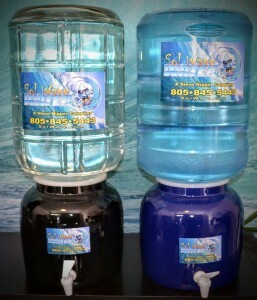 Locally owned and operated, Sol Wave Water, delivers to your home or office. Now offering bottled water in Santa Barbara, Montecito, Santa Ynez Valley and Ventura County! Delivered to your home or office as Little as $8ea? Simple Convenience, Rental or Purchase? Water when you need it, We keep your stock Fresh! Sol Wave Water Keeping it Simple! The Central Coast has some of the worst tasting water. The deposits in our tap water are known to leave residue in pots when used to cook, makes foggy ice, and is not pleasant to the taste. 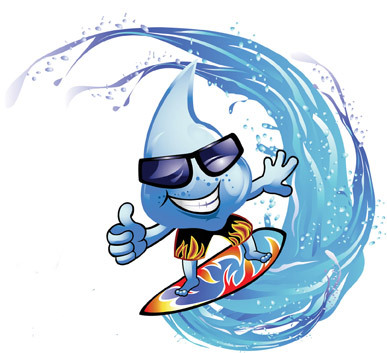 Residents of Santa Barbara, Ventura, and Oxnard require great water for their drinking needs. “Big box” delivery companies don’t have local service, your call might get transferred to another state or country, and they are expensive. 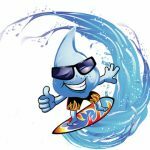 Let Sol Wave Water deliver your bottled water here on the Central Coast. We offer standard polycarbonate bottles with handles as well as glass bottle delivery. Use your own dispenser or rent or purchase one from us. Both of our bottles have the same Reverse osmosis purified ozonated water. For cost reasons, and ease of changing the bottle, most customers select our polycarbonate bottle or BPA-Free with the cast-in handle. Our standard delivery is a 2 week rotation where we come to your home of office and exchange your empty bottles for full. We DO NOT require a monthly volume, don’t have extra delivery fees, and no surcharges. You only pay for the bottles you need. Our standard bottle charge is $10 for poly, and $15 each for BPA-free. If you love the look of our glass bottle come in and we have them for purchase. You can fill them right here at our office! There is not usually a deposit charged. Please call us for optional pricing for high volume or for more information on weekly or monthly delivery. We are happy to match most companies pricing when you include their delivery and surcharges. Glass Bottles are $15 each to purchase. Call today and see about trying a bottle Free! 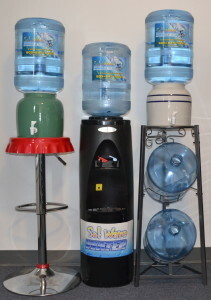 We at Sol Wave are happy to offer a full line of water dispenser to fit your needs and budget. 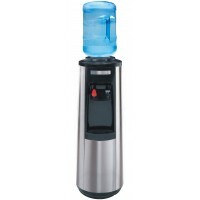 When you add a dispenser to your office or home, you will enjoy the convenience of delicious water at your fingertips and will enjoy the health benefits of drinking premium purified water. Get away from expensive beverages like soda… You and your kids will be happy you made the change! 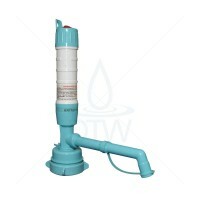 Easy and no plumbing – Reverse osmosis systems require a water supply and a drain for the contaminants disposal. Bottled water is delivered ready to drink! Healthful – It’s important to note that some people are more vulnerable to getting sick from contaminants in drinking water. You may be in this group if you are undergoing chemotherapy, living with HIV/AIDS or have received a transplant. Pregnant women, older adults and children also may be at greater risk. Talk with your doctor about whether you should take additional precautions, such as boiling tap water or drinking bottled water. Convenient –Bottled water provides people with a portable, convenient, sanitary way to drink great tasting water on the go and gives them a calorie-free choice for their active, healthy lifestyles. Research shows if bottled water weren’t an option, 63 percent of people who drink it say they’d instead choose soda or another sugary drink. Only 16% surveyed said they’d turn to tap. Faced with epidemic obesity rates, Americans have increasingly chosen to forego sugared drinks, like sodas, turning instead to water for healthy hydration at home and on-the-go. Between 2000 and 2011, bottled water consumption increased by 75% – or 12.5 gallons per person – in the United States, while consumption of carbonated soft drinks dropped by nearly 18%, or 9.5 gallons per person. Water softening – It’s good for you and the environment! Thank you, Steve, for saving me and my daughter from dying of thirst at Santa Barbara Earth Day yesterday! The water at your stand was cool, clean and delicious. Cool water bottle, too. We are truly grateful! !